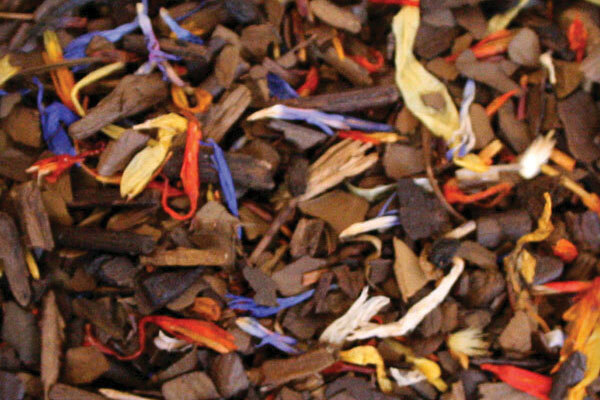 Raosted mate, cocoa, rooibos, sunflower, cactus, cornflowers and almonds. Coffee substitute, great with milk. Perfect of American Breakfast. Must Try! This is a pleasant yet rather unusual yerba maté blend. I am really enjoying it! Roasted yerba maté and chocolate really complement each other very well. The combination of the deep, toasty, earthy flavor of the yerba maté and the rich, smooth chocolate is just so decadent and yummy! There is a faint sharpness to this cup as well, and I attribute that to the sunflower. It is very faint, though, and might otherwise be missed if you’re not trying to find it. The almonds and chocolate – being a classic flavor combination – work well together in this blend as well. I can also detect the woodsy rooibos flavor, but, again, this isn’t strong enough to really compete with the stronger, pungent flavor of the maté. I am not really sure what contribution the cactus makes to the overall flavor of this tisane, although there is a fruit note to this tea that I cannot otherwise place. Perhaps that is the cactus? I can’t say for sure, but I don’t think that this blend would be quite the same without the cactus. I’ve tried a couple of chocolate flavored maté blends, but this one stands alone because it has a more complex flavor to it – perhaps because of the rooibos, or the almonds, or the sunflower, or even the cactus. Or, maybe it’s because of all of these components and how well they work together in this cup.